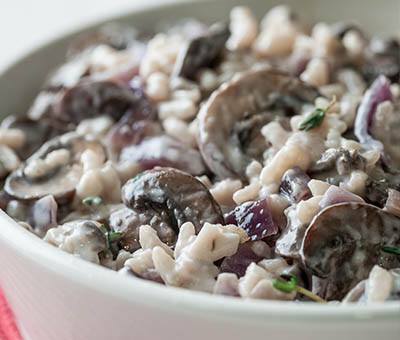 Impress your family and friends with this delicious mushroom risotto. Heat the oil in a large sauce pan, add the onion and fry till browned, add the mushrooms and cook through. Add in the garlic and fresh thyme. Pour in the rice and fry for 1 minute until the rice turns glassy around the edges of the grains. Pour over the white wine and allow to bubble until the alcohol evaporates. Mix your stock pot with 750ml boiling water. Keeping the pan on a medium heat, pour in a third of your stock until the rice has absorbed all the liquid, stir frequently. Repeat this process twice more. The rice should be creamy, plump and tender. Simmer rice until you are sure the rice is cooked. When all liquid is absorbed, add Carnation Evaporated Milk and cook for a further 2 minutes. Remove from heat and stir in the parmesan cheese.